This is the sermon I preached at St. Mark and St..Timothy Lutheran churches on Sunday, 12/10/17. The text is Mark 1:1-8. In Matthew and Luke, we have detailed stories of angels and shepherds and magi and angry kings. John’s gospel is an entirely different matter. But you have to love Mark’s version of things. He cuts right to the chase. There is no birth story. His gospel is the good news of Jesus Christ, the Son of God. The rest of the gospel explains how he can make that claim. But the beginning of the good news is not the gospel or anything else in the New Testament because the story of salvation and God’s loving interaction with humanity began in Genesis “In the beginning;” in creation. Immediately after Mark’s introductory verse, he goes back to the prophets of Israel and the promises God made through them. Mark cites Isaiah, but what we have here a mash-up of Isaiah, Malachi and the author of Exodus (Exodus 23:20; Malachi 3:1; Isaiah 40:3). We hear “the voice of one crying out in the wilderness” (v. 3). “The wilderness is key to Israelite history. It was in the wilderness that God tested the people and it was in the wilderness that they rebelled. It was in the wilderness that God saved them again and again, and the wilderness was the crucible where they become a nation. The wilderness was both a route to the Promised Land and a place of exile. It was a place where people sinned and where they also repented to restore their relationship with God” (Bob Cornwall). Right away, Mark connects the good news with the Old Testament prophecies of salvation, which traditionally come from the wilderness. Moses, Elijah and David all had to flee to the wilderness. Jesus will emerge from the wilderness to begin preaching good news and will return to the wilderness several times. Now we come to John, who is reminiscent of Elijah—wild and wooly—a man who is at home in the wilderness, wearing strange clothes and eating strange food. John’s ministry was a bridge between the prophets of the Hebrew Scriptures and Jesus. God wanted to make it plain that our Lord, the redeemer, was not disconnected from the God of the Old Covenant. He is the fulfillment of those prophetic promises to the people of Israel. 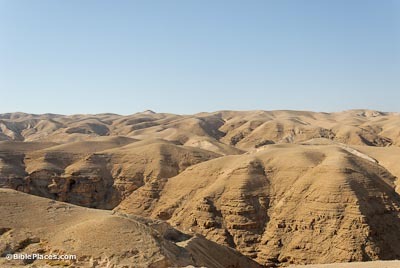 John’s preaching and baptizing occurred in the wilderness, which was a scary place. It was thought of as deserted (obviously! ), inhospitable, lacking food and water. It was the haunt of animals, demons and death. 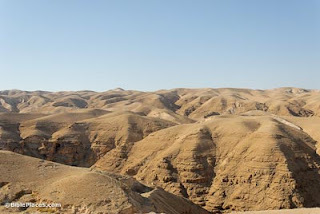 However, it was also the place where Israel was faithful to God before entering the Promised Land. It was a place of new beginnings. John proclaimed the coming of Jesus and was his forerunner in several ways. The wilderness would be important for both of their ministries. Both will call people to repentance. Both will be betrayed and arrested and killed because of God’s message. God meets us in our wilderness. In Chautauqua County, we don’t have any real wilderness, in the sense that they have in the Holy Land. Where I lived in Bethlehem was wilderness, even though it was populated. I could look out from my balcony and see the Judean Wilderness, which was blindingly beige in the daylight; yet in late afternoon and early evening, it took on a pinkish hue that was beautiful. We do not have to be in a physical wilderness to experience one. There are times when our lives are dry and we are bone tired. There are all kinds of wildernesses we may go through. As we wait in Advent, we wait in the wilderness for God to hear our prayer and deliver us. High school seniors wait for their acceptance letters from the colleges of their choice. A young lady may wait for a proposal from her beloved. We wait for doctors’ reports of the tests we’ve been given. Sometimes we wait and hope for a cure. All over the world today many are in the wilderness. The people of Southern CA long for rain to help with the forest fires. The peoples of the Holy Land long for peace and an end to the conflicts. Parents of a drug addict cry out for their son or daughter’s deliverance. Our wilderness is hard and we may be in it a short time or a long time. Whatever the wilderness, God will meet us there, just as he met the people of the Old Testament, those who heard John and all of us through the death, burial and resurrection of our Lord Jesus Christ. We are not alone in our wildernesses. Jesus is with us, holding us, comforting us and transforming our lives to be more like him. Our wilderness can be like a crucible, purifying us. That’s all well and good, but so what? John promises the people that someone is coming after him who will baptize with the Holy Spirit. That’s Jesus! Jesus is the one who immerses, submerges and overwhelms us with his Spirit, with the presence of the living God. Jesus brings us through our wilderness. He is our food and drink; our companion; everything that we need to get through the difficulties of this life and he gives us a foretaste of the feast to come. All of Mark’s story is only a beginning. All of us are challenged to continue the story of God breaking into our lives in our own way. God wants to prepare the way in us. God doesn’t do this simply for our own benefit. How do we respond when we read or hear the news from all over our world? The pictures of the forest fires in Southern California have been incredible. To see people’s houses as mere shells shakes me to the core. Do we just sit back thinking, “But by the grace of God…?” Are we simply thankful that it’s happening to someone other than us? The other day I was talking on the phone with a woman who lives in Southern California. From her office window she could see the various fires in her area. I told her we would be praying for her and the people affected by the forest fires. She asked that we would pray for rain. We can also give through Lutheran Disaster Relief. I confess I am not always the most faithful at praying for people I don’t know—and yet God knows them and cares about them, so shouldn’t we? Because of my years in Palestine, my heart goes out to the peoples of the Holy Land. I am appalled as I see the streets of Bethlehem filled with violence. These are places I used to walk with my kids! What can we do? We can pray. We can write our politicians concerning decisions we deem as destructive to any possible peace process. We can check out the ELCA’s site, “Peace, Not Walls.” We can support our Christian brothers and sisters there in prayer. Did you know that there are Arab Lutherans in the Holy Land? They are part of the Evangelical Lutheran Church in Jordan and the Holy Land. What are we doing here, closer to home? The opportunities are abundant. The needs are many. Maybe we feel like we are too busy to help out. If that’s so, then we need to start saying “No” to some of our involvements and let God use us to be God’s presence and to help others out of their wilderness. What about the people we see everyday at work and other places? Can we be as Christ to them? Can we listen when they need to vent? Can we share the stories of what God has done in our own lives? Can we be life-givers for them? I am not trying to heap guilt on any of us. Many of you are involved in multiple ways to help others. I give thanks for each and every one of you. Keep it up. Advent is about waiting and the coming of God. We await Jesus’ coming as a baby born in Bethlehem. We await his return as the glorious king. God will come and fulfill all of God’s promises whether or not we do anything. We are called to repent and believe the good news and to share it with others. Knowing God is on the way, why wouldn’t we want to do these things?